Tuesday November 8th is election day, and polls begin closing across the county at 6 p.m. Eastern time in parts of Indiana and Kentucky. However, voting across the county concludes at 1 a.m. Eastern time on the western islands of Alaska. 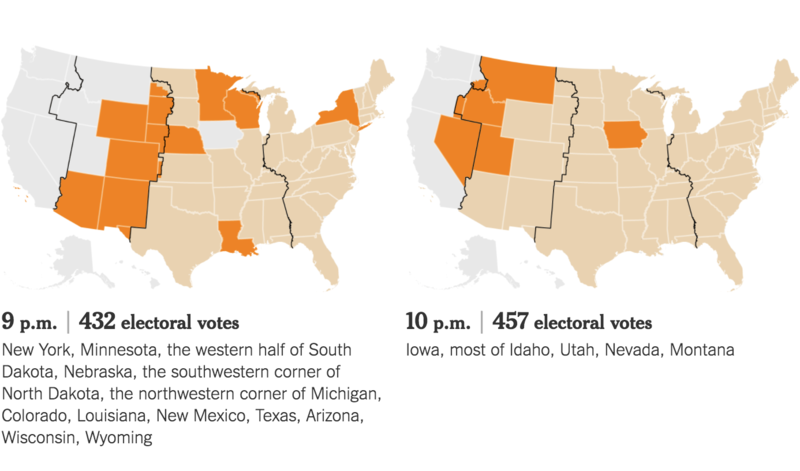 The New York Times, created a simple yet effective graphic that maps when polls close in each state, and how many electoral votes are at stake and showing each candidate’s path to the required 270 electoral votes. This information graphic logically unpacks information in several easy-to-understand maps and charts helping readers better understand the election process and at what point a winner may be determined. Area charts display the total electoral votes from the states expected to vote Democrat or Republican, and the electoral votes from contested states. This allows the reader to understand what it would take for each candidate can win, and at what time a winner may be declared. For example, if Hillary Clinton secures all of the contested states, she will have enough electoral votes to win the election by 9:00 p.m. This information graphic is a clear demonstration that simple visualizations, can help readers better understand complex systems. This entry was posted on Tuesday, November 8th, 2016 at 11:09 am and is filed under INFOGRAPHICS. You can follow any responses to this entry through the RSS 2.0 feed. Both comments and pings are currently closed.